Cookbook #239: Italian Regional Cooking, Ada Boni, Bonanza Books, NY, 1969. Translated by Maria Langdale and Ursula Whyte. 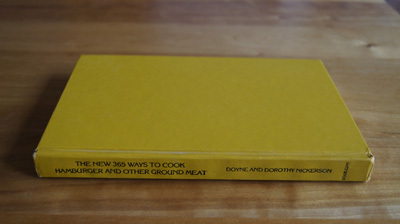 In my “250 Cookbooks” data base, I entered the publication date for this book as “1969?” Huh? Why the question mark. I went to the copyright page of Italian Regional Cooking and found “© MCMLXIX”. Oh, I see, and sure enough, when I read the whole field in my database, it reads “1969? MCMLXIX”. I had translated the Roman numeral to an Arabic numeral as “1969”, but didn’t check to see if I was correct. Turns out I was: search engines today quickly pulled up the conversion of MCMLXIX to 1969. Kids today no longer need to learn those rules in school, I guess. 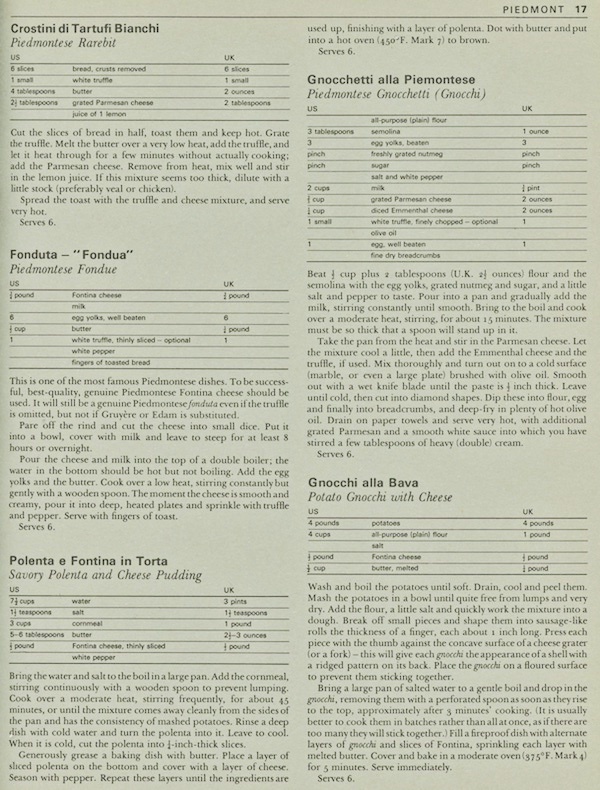 Italian Regional Cooking was a gift to my husband and me on 5/25/77 from a couple-friend of ours. We were living in our trailer in Boulder at that time – opening this book brings back memories. But have I ever used this book? I don’t think so. 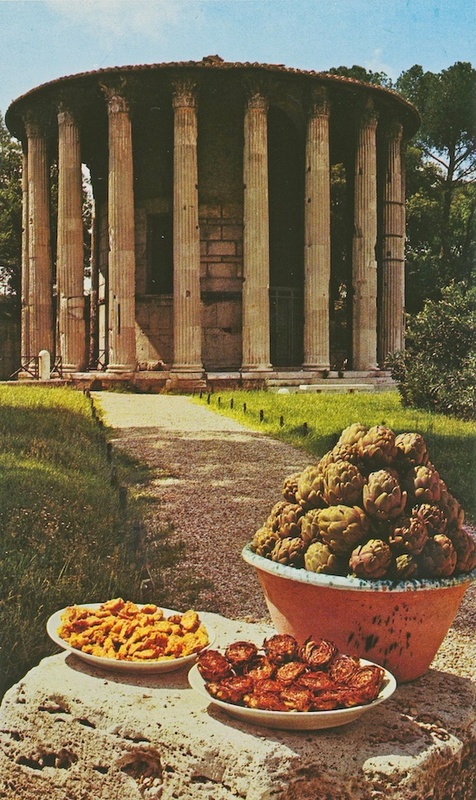 It is a lovely book to page through, with full page glossy photos of regions in Italy. We have always loved Italian food, and I love to cook, so it was (in theory) a perfect gift. I looked up Italian Regional Cooking online. It is still for sale as a used book; I do not see a newer edition. On thriftbooks.com, several people wrote reviews about this cookbook. I learn from them that this tome is considered a classic Italian cookbook, kept for years by families and cooks alike for its authentic Italian recipes. Readers of this book who had traveled to Italy write that it reflects accurately the cooking of the regions of Italy in the 1960s. The “perfect gift” and a “classic” cookbook. So why haven’t I used Italian Regional Cooking a lot? Let’s see. 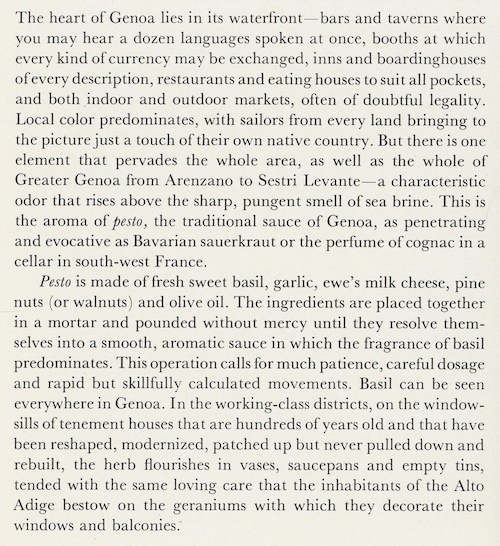 I take Italian Regional Cooking and settle in a comfy chair and begin to read, to learn what book I hold in my hands, and to wonder why I have never embraced it as a favorite cookbook. To me, this is an abrupt beginning. It had me looking on the previous page, to see if I missed something. And I looked for an introduction to this book, but, there is none. 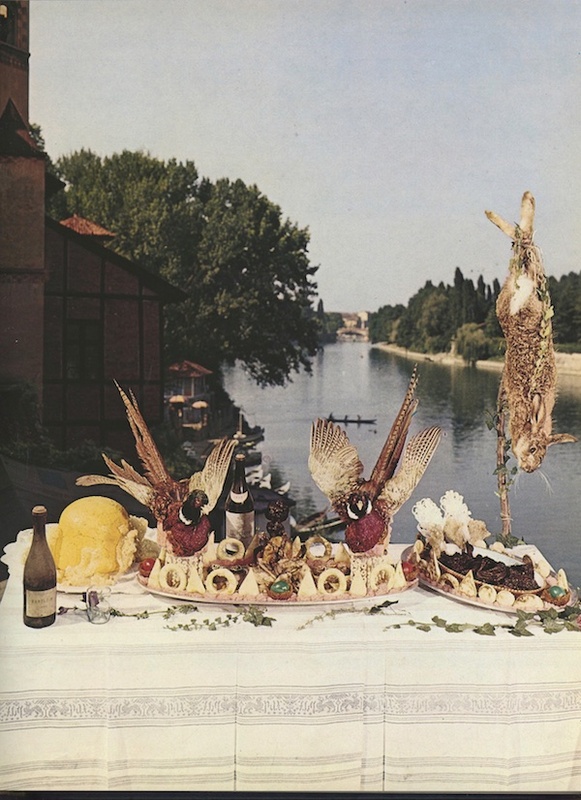 I see what might have turned me off about this book: the dead rabbit staring at me from a stick placed above a plate of its cooked bunny friends. And the handsome dead birds on the table. Ironic, since the friends who gave us this book were vegetarians. 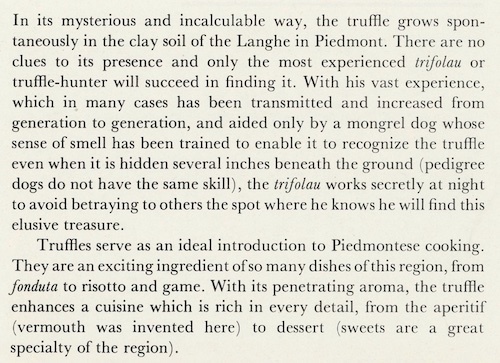 After these written and photographic descriptions of the Piedmont region are several pages of recipes. These are printed on rough, grey paper in a smaller font. 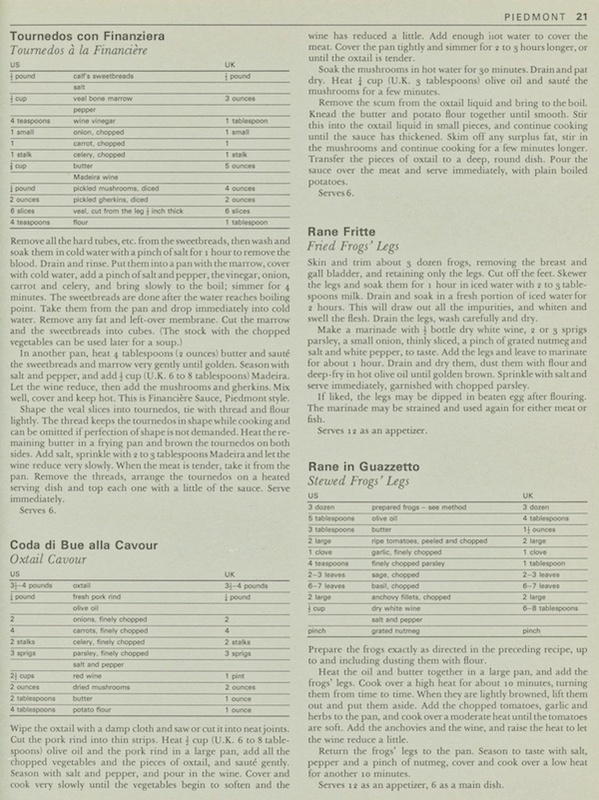 Bolded recipe titles are in Italian, with the italicized English translation beneath. Here is an example. Recipes for gnocchi (two types, and made from scratch), rarebit (learned about in my Encyclopedia of Cooking), fondue, and polenta. 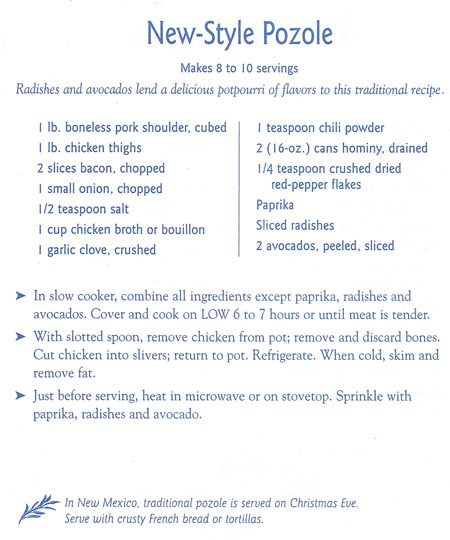 Here is another example of recipes in the Piedmont chapter. These ingredients aren’t as “Patty-friendly” as they are sweetbreads, oxtail, and frogs legs. To this day, polenta, made from corn, is a popular dish in the region of Veneto. And polenta, as a grain or pre-cooked, is easily available in our local supermarkets. Even I have served it as part of an Italian meal. 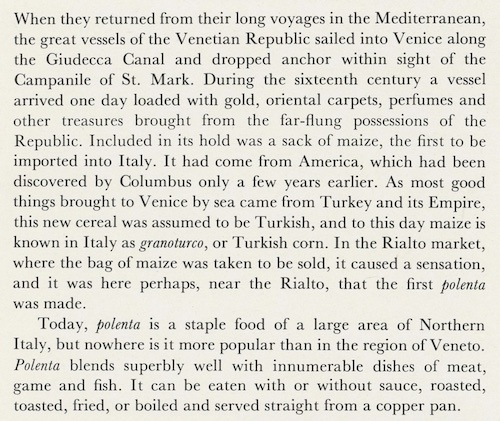 The recipes in the Veneto chapter include polenta recipes, recipes for noodles from scratch, and recipes that call for ham, duck, mutton, chicken, pork sausage, shellfish, beef, lamb, pigeon, rice, liver, tripe, cod, guinea fowl, turkey, snails, eel, and a variety of vegetables. Pesto is the traditional sauce of Genoa, in the Liguria region. 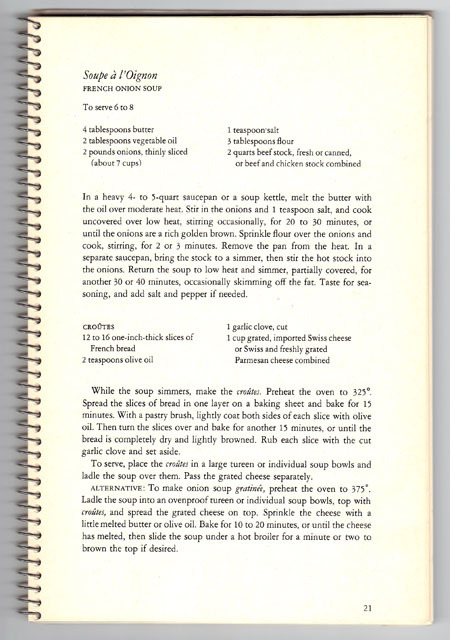 I find a recipe for zabaglione, mentioned in my Encyclopedia of Cookery Volume 12. And so Ida Boni’s Italian Regional Cooking continues. I turn the pages and enjoy new stories, and more wonderful photos of the regions of Italy. It is a very good read. The recipes? I can’t get the ingredients for a lot of them (even if I wanted too) and many require a lot of work (making your own pasta and gnocchi). I now have the time and ability to make my own pasta, so eventually I may try a few of the harder dishes. 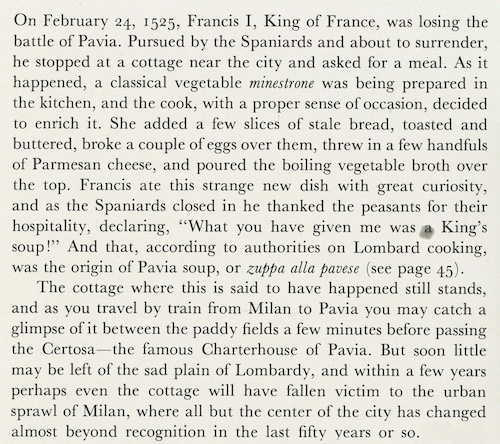 I will definitely keep Italian Regional Cooking as a “classic” Italian cookbook. 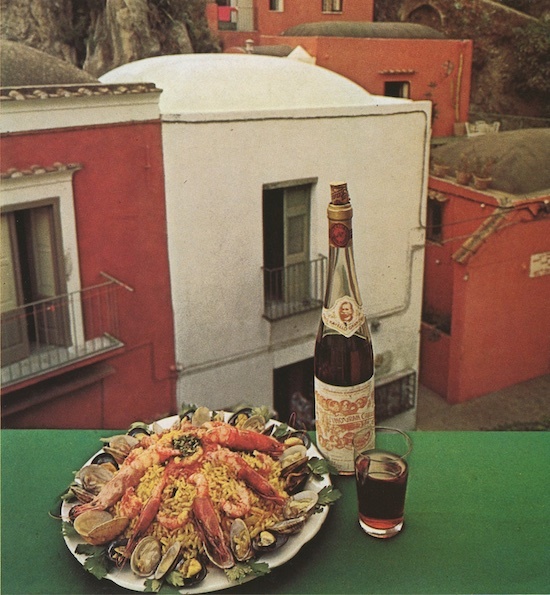 Back in 1977 when we received this cookbook, I would have only been looking for recipes for pasta and pizza, because that’s all I thought of when I thought of Italian cooking. But now I have traveled to Turkey, near Italy, and have savored the very fresh vegetables and seafood ubiquitous to that country. I have made my own pasta, and learned how to make a very good tomato sauce. I have cooked polenta, and used saffron. I understand and appreciate how Italian regions’ cooking depends on the very fresh game and fish surrounding them – what they ate was controlled by what they could harvest, not by a huge food industry. I can appreciate that this book reflects older Italian cooking, now often overtaken by convenience foods in the current busy cultures. Note: I covered Italian Light Cooking a couple years ago. 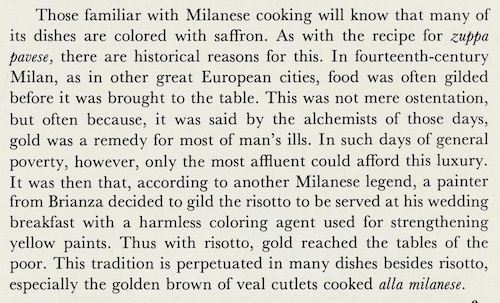 In it, the author states that “light” cooking is the more traditional Italian cooking, with less red meat and cheese. That is what this book is all about too. 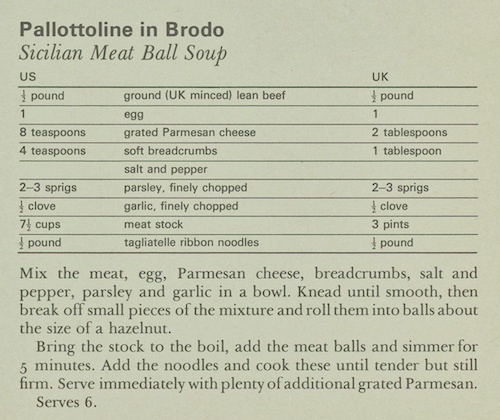 For this blog, I will make Pallottoline in Brodo, or Sicilian Meat Ball Soup. This is a simple soup, just meat balls and noodles in broth. The only herb is parsley. As I was preparing it, I had to keep my hand from grabbing my usual Italian spices, like oregano, basil, and thyme. I also had to stop from adding vegetables to this soup, like carrots, celery, and onions. The only change I made was to halve the recipe to serve only two people, but keep the amount of ground beef the same (1/2 pound). Oh – at the last minute I added about 3 tablespoons tomato sauce. I’ll leave that as optional. Tagliatelle noodles are similar to fettuccine noodles; if possible, find flat noodles about .25 to .375-inches wide. Mix the meat, egg, 3 tablespoons Parmesan cheese, breadcrumbs, parsley, garlic, and salt and pepper in a bowl. (I used a mini food processor to make the bread crumbs and chop the parsley and garlic.) Knead until smooth, then break into pieces and roll into balls about the size of a hazelnut. Bring the stock to a boil. Add the meatballs and cook about 5 minutes. Add the noodles and cook until the noodles are tender but still firm. 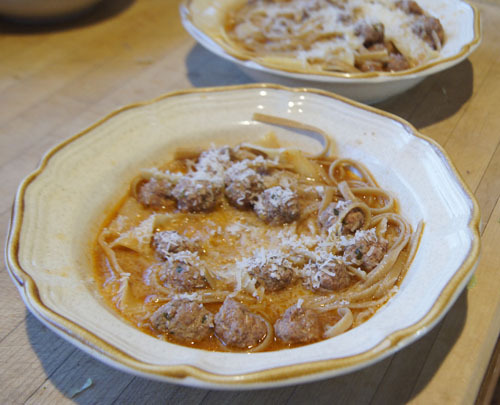 Serve immediately with plenty of freshly grated Parmesan cheese. This was a very thick and very filling soup. It was good, but actually too much for the two of us. I might make it the same way again, or I’d use half the amount of meatballs and serve it as a first course. The flavor was good and I always like meat balls, so I wasn’t complaining! 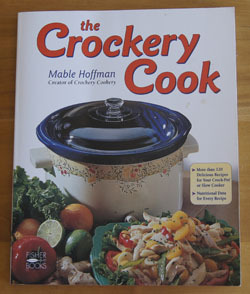 Cookbook #173: The Crockery Cook, Mable Hoffman, Fisher Books, Tucson, AZ, 1998. I picked this book off the shelf because a long-cooking meal fit into my schedule one day. Lately I just use the crockpot to cook pots of pork green chile and shredded beef. Time to shake up our meal times with a new recipe. The Crockery Cook is nicely formatted and illustrated, with a large variety of recipes. I think I could always find something to cook from this cookbook, so I decide to keep it. And for this blog? I decide to make “New-Style Pozole”. I like hominy, and the bacon should add a nice twist. I have some hot peppers (my daughter grew them!) in my refrigerator, and we like things hot, so I’ll add them to the pot. 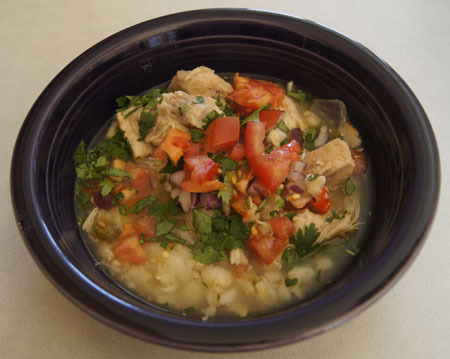 It’s best to prepare this recipe the day before to allow time for cooling the pozole so that you can skim off the fat. Mix all ingredients in a crockpot and cook on low 6-7 hours or on high for 3-4 hours. Add water as necessary to keep it soupy. Check seasonings and add salt and peppers to your own taste. Let the pozole cool, then remove the chicken thighs. Bone them (if necessary) and chop into small pieces. 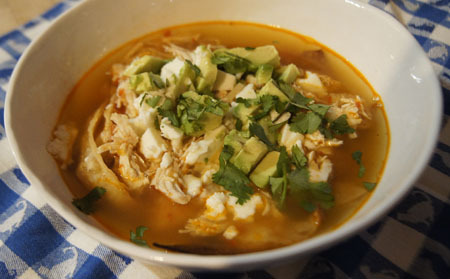 Put the pozole in the refrigerator overnight, then skim any fat from the top. Re-heat and serve with garnishes of your choice. This was good, but not perfect. I thought the hominy was overcooked, too mushy. I couldn’t decide if it was a soup or a stew, but that doesn’t really matter! We like our Mexican food spicy, so if I make it again, I’ll add more peppers. I served it with grilled quesadillas and it was a satisfying meal. This book is an unexpected pleasure. M. F. K. Fisher turns out to be “Mary Francis Kennedy Fisher”. I had never heard of her, so I looked her up online. According to Wikipedia, she was one of the preeminent American food writers of the twentieth century. A website devoted to her life and works is a good online resource for this interesting writer. Much like my experience with The Cooking of China, a Foods of the World cookbook I covered in a previous blog post, I have discovered another fascinating woman culinary author from the mid-twentieth century. Fisher was born in Michigan in 1908 and grew up in Southern California. Her family was “highly literate” and she was writing poems as a young girl. In college, she met Al Fisher; they married and soon moved to France for several years. She learned to love the people’s food of France: cooked in home kitchens with fresh ingredients. She loved to write, she loved cooking – so she combined her two passions as a food writer. Her first book, Serve it Forth, was published in 1935. Her last was published in 1992. I like her style of writing, her prose, her sense of humor. Her essays are a mixture of memoir, travel, and culinary tales. I checked out a compilation of her works from the library, “Art of Eating”, and am enjoying the read. I am caught first by the recipe for French onion soup. I don’t believe I’ve ever made it! Time to try. Fisher’s version begins with cooking the onions slowly until they are nice and brown, then adding beef stock. (The recipes in this book for chicken and beef stocks are almost exactly like my own self-evolved stock recipes for the same.) 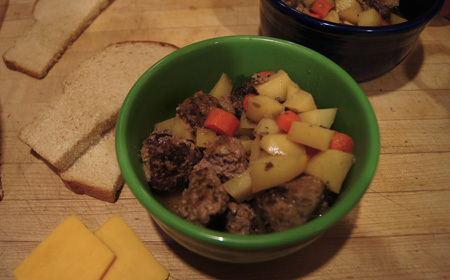 The soup is topped off with a crust of bread, cheese, and a run in the oven. Okay, soup to start my meal. Now I need something to go with the soup. Luckily this book is brimming with good recipes. I’ll make French bread for sure. For dessert, I choose clafoutis aux cerises, or cherry cake. This is sweet cherries baked in an eggy batter with lots of vanilla. So I settle in early on a rainy Saturday to begin the bread. I cooked (played?) off-and-on all day on my French provincial dinner. Everything came out perfect. 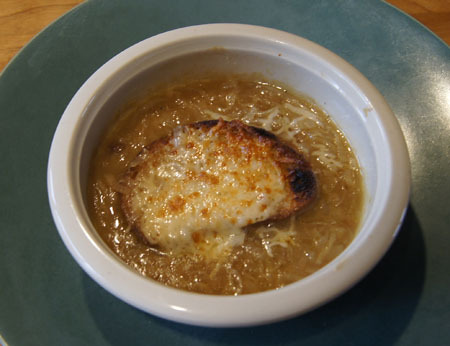 As my official recipe from this book for this blog, I’ll write up only the French onion soup. Here is the recipe: I made it almost exactly like the above recipe, except for downsizing to serve just two people. Melt the butter with the oil in a saucepan. Stir in the onions and salt and cook, uncovered, over low heat, stirring occasionally, for about 30 minutes. They will become a rich golden brown if you have the patience to do this step carefully. 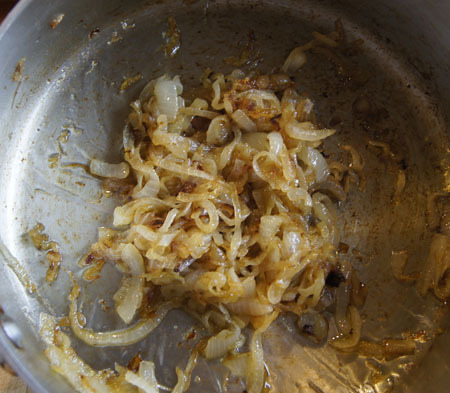 Sprinkle the browned onions with the tablespoon of flour and stir for several minutes. Add about 3 cups of the stock slowly, with stirring. Simmer, covered, for about 45 minutes. Add more stock if the soup is too thick, and adjust the seasonings. While the soup is simmering, or even earlier in the day, make the croûtes, or toasted bread slices. Put the 1-inch thick bread slices in a 325˚ oven for 15 minutes. Remove from oven and drizzle or brush each side of the slices with olive oil. Put them back in the oven (preferably with the side that used to be up now down) and bake for another 15 minutes, until they are lightly browned. 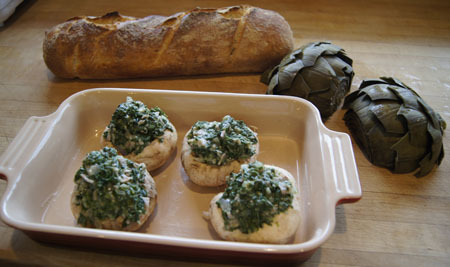 Remove from oven and rub each slice with the cut garlic clove. Divide the soup between two ovenproof soup bowls. Put a croûte on top of each and sprinkle with the grated cheese. Bake for 10-20 minutes in a 375˚ oven. If you like, as a last step, put the soup bowls under a broiler for a couple minutes to brown the tops. The rest of the meal – the fish with aioli and the cherry cake – tasted great but were not terribly photogenic. Another magazine cookbook. This one is hard bound, full size, and about 90 pages. I have no idea how I acquired this cook book, and have no notes in it. So. 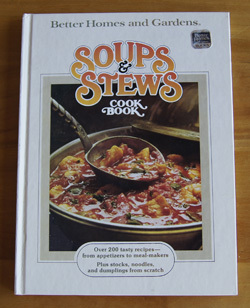 At first glance, I find this a decent compilation of recipes for soups and stews, but not terribly inspiring. I usually just toss together a soup sans recipe, using whatever is on hand that catches my eye or imagination (or that needs to be used up). 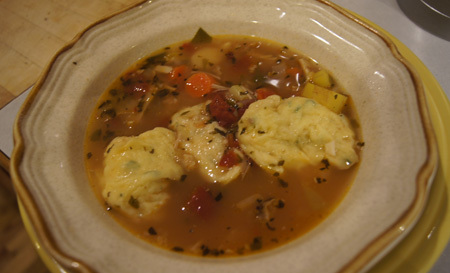 For this blog, I settle on “Turkey Soup with Danish Dumplings”, because I have turkey stock from last Thanksgiving and leftover turkey too. What the heck are Danish Dumplings . . . ? I am directed to page 90 at the back of the cook book. And at page 90, I discover a few gems. Homemade noodles: plain, spinach, or cheese, made using a simple dough rolled out on a breadboard. Dumplings: Danish, fluffy, matzo, corn, and herb. Crackers! Either from white or whole wheat flour. I am a little bit goofy but I really want to try all of these. They will perk up my soup making. About the soup recipes. The section on cold soups does not interest me. The hot soups are mostly pretty quick to put together, and in general call for fresh vegetables (good) and few packaged ingredients (good). Nutrition information is not included. I see some good ideas for soups; I am reminded that I haven’t made wonton soup in ages, or a Mexican-style soup. So I have some ideas for future meals. This cook book does serve a purpose and I will keep it. I am going to have to re-name the soup “Turkey Soup with Sneaky Dumplings”. More on that later. I have my own turkey stock and cooked turkey in the freezer, so I will use those instead of following the above recipe. We don’t like turnips so I plan parsnips instead. I will also shake in a few more herbs. Combine the stock, cooked turkey, tomatoes, celery, parsnip, carrot, onion, parsley, basil, thyme, bay leaf, and salt in a cooking pot. Simmer about 30 minutes, covered. Remove bay leaf. While the soup simmers, prepare the dumplings. Combine the butter and water in a small pan and bring to a boil. Mix the flour, baking powder and salt and dump in all at once, stirring vigorously all the time. Continue cooking, stirring constantly, until the mixture forms a ball that doesn’t separate. Remove from heat and allow to cool slightly. Add the egg and immediately beat it into the dough until the mixture is smooth. Stir in the parsley. Drop the dumplings from a tablespoon into the bubbling soup, making about 8 mounds. Cover the pot and simmer, covered (do not peak!) for 20 minutes. The soup is good, the star is the dumplings. The dough for these Danish dumplings is a cream puff dough, or pâte à choux. I have made cream puffs before: when you bake them in an oven they puff up and leave a big hole in the middle. As a scientist, I find this just a lot of fun. As an eater, well, yum! Fill them with cream for cream puffs or a filling for eclairs or a savory mixture for appetizers and you have a special treat. Baked, unfilled cream puffs are convenient because they store for awhile (you don’t have to cook them at the last minute). The disadvantage, in my often-on-a-diet lifetime, is the high percentage of butter in the recipe. Okay. We know what cream puff dough is. It is usually baked on a sheet in a hot oven. On top of a wet soup? How will this turn out? I note that the original recipe tells me to not lift the pan lid while the dumplings are cooking. Probably so that the dumplings will cook through. Can I resist the temptation to peak? No, but I can get around the obstacle by using a glass lid. About 20 minutes before serving the soup, I drop 8 small globs of dough on top of the bubbling liquid. I note that there is a lot of soup surface uncovered. I cover the pot. A few minutes later, I look over at the cooking pot. Whooa! The dumplings have grown! And a few minutes later, they have grown so huge that all I can see on top of the soup is dough, reaching almost up to the pan’s lid. I worry a bit that the soup will be overtaken by the dumplings. Just before I serve the soup, I look in the pan: Oh! The dumplings shrunk! Now they are just nice-sized blobs on top. So I call them “sneaky dumplings”. During their cooking, they stretch way up to the lid and then retreat back. If I had used a solid lid I wouldn’t have caught the dumplings in the act. These dumplings are fun, but are they good? Yes! They are delicate and tasty and a great addition to a soup. And they take very little time to put together. I will make them again, definitely! 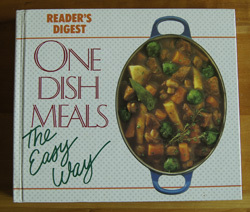 Cookbook #29: One Dish Meals, The Easy Way. Reader’s Digest, The Reader’s Digest Association, Pleasantville, NY/Montreal, 1991. All of the recipes in this cookbook use “the convenience of serving a complete meal in a single dish” (from the preface). The chapters include cooking basics, soups, meat, poultry, fish, vegetarian dishes, pasta, salads, appetizers, desserts, and more. Each recipe includes nutritional information, touted as “weight-watching calorie counters”, as well as suggestions for cutting fat and calories. The book is nicely laid out, the recipes easy to follow, and the photos are great. 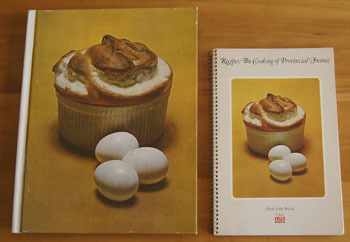 This was one of my mother’s cookbooks. She noted on the inside cover that it is “from Reader’s Digest contest, May, 1993”. I’m not sure quite what this means; maybe she entered a contest and the book was the prize? I’ll never know. My mother marked several recipes as “tried” in this book. Minestrone with Turkey Meatballs is marked “Delicious” and also as having “great directions”. Mozzarella Meat Loaf Pie was “not great”. Chicken Breasts Catalan was “good but not worth the fussing with”. Turkey Sausage Succotash is marked “very good”. This reminds me of my parents liked lima beans in soups and also succotash. She had marked a recipe for Ham and Lima Bean Soup to try. I found it easy to find recipes for myself to try in this cookbook. Note that plural: recipes! A lot of them have over 600 calories per serving, but if that’s the entire dinner meal, it’s not terrible. Some, though, have over 900 calories, a bit daunting to fit into a low-calorie plan. 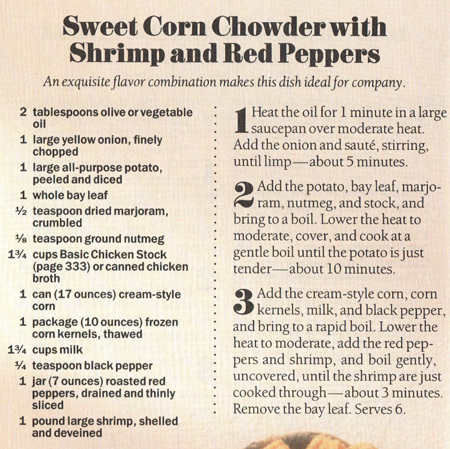 I chose a recipe for “Sweet Corn Chowder with Shrimp and Red Peppers”. It has only 280 calories per serving, and I have some very good frozen shrimp in the freezer. I also have a jar of roasted red peppers in my pantry that needs to be used. I am impressed that the instructions direct you to cook the shrimp only 3 minutes – it shows that they know what they are doing. I made a half recipe as per the typed-in recipe below. Cook the onions in a few drops of vegetable oil, sweating with a little salt, until the onions are limp – about five minutes. Add the potato, bay leaf, marjoram, nutmeg, and stock, and bring to a boil. 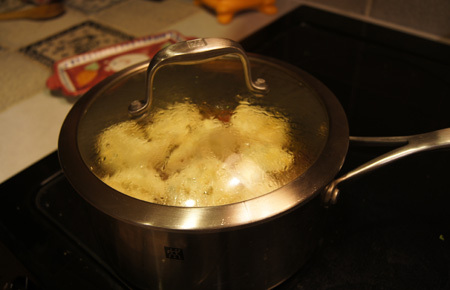 Lower the heat, cover, and simmer until the potato is just tender, about 10 minutes. 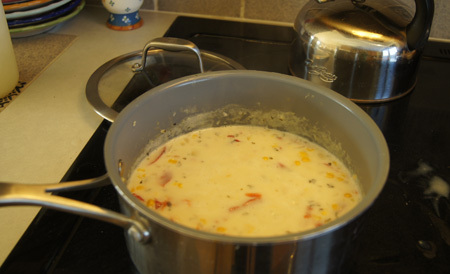 Add the cream-style corn, frozen corn, milk, and black pepper, and bring to a rapid boil. Lower the heat to moderate, add the red peppers and shrimp, and boil gently, uncovered, until the shrimp are just cooked through – about 3 minutes. Add salt and pepper to taste. Remove the bay leaf before serving. But the finished soup was worth the trouble. 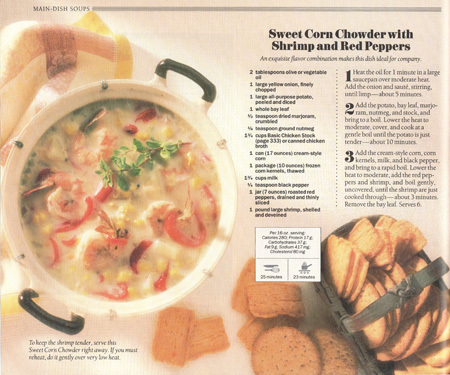 If you like corn and shrimp, you will like this soup. I took a cast-iron grill pan, very heavy, and put it on my electric stove top and heated over medium-low heat for about 10 minutes. (It’s important to heat the pan long on low heat.) I set a metal measuring cup with a small amount of butter in it on the grill pan. When the butter had melted, the pan felt hot to a hand held an inch above the pan. Time for the sandwiches. I took rosemary-sourdough bakery bread and stuffed grated sharp cheddar cheese between two slices to form sandwiches. Then I brushed the tops of the sandwiches with melted butter and carefully flipped them to place them butter-side down on the heated grill pan. Then, I brushed the other side of the sandwiches with butter. I peaked at the bottom sides and turned when golden. When both sides were golden and the cheese melted, time to eat! You can see them in this photo of the soup, dripping cheese and golden. Cookbook #8: The New 365 Ways to Cook Hamburger and Other Ground Meat. By Doyne and Dorothy Nickerson, Doubleday & Company, Garden City, NY, 1983. I think this book used to have a cover leaf, without it it looks so plain. But it is a plain little book. There aren’t any photos inside, although there are some pleasant drawn illustrations. The recipes are pretty plain too. Why did I buy it? Dunno. Guess I wanted hamburger ideas. I don’t think I ever cooked anything from this book, although I had marked several pages. Those pages were for . . . meatballs! I am a huge fan of meatballs. I could eat meatballs once a week. They are right up there among my top comfort foods. I guess I already hinted at that when I chose to make the Pork Balls from cookbook #6. I like mushing the meat with the spices and egg, I like forming the meatballs, I love the aroma as they sizzle and cook in the pan. And I like the convenience of making extra, freezing them, and popping them into a sauce later for a quick meal. Oh, and I like stealing one as they sit on the counter to cool—hey, it’s important to taste them to make sure they are good! The only recipe in this book I marked besides the ones for meatballs is one for gnocchi. I’ve tried several times in my life to make gnocchi from scratch, but nowadays I use the shelf-packaged product that you can find in most grocery stores. Do I like this cookbook? It’s okay, but doesn’t have very many innovative ideas, nor are there commentaries to personalize the 365 recipes. The original publication date was 1958 and today, the recipes seem tired. Grilled hamburgers, skillet dishes, baked casseroles, soups, spaghetti meat sauce, tacos (with no seasoning other than salt), meat pies. If you have a hankering for a nostalgic hamburger pie with crescent rolls on top, this is your cookbook. It’s mostly basic hamburger cooking, the kind of cooking that doesn’t require a recipe. I could give this cookbook away and never miss it. 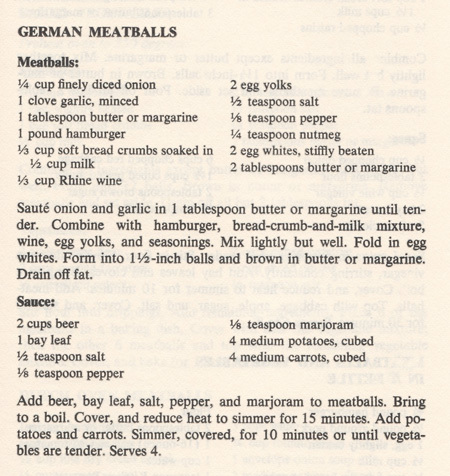 I chose German Meatballs, one of the recipes that I had marked years ago. I’m not sure if I tried this recipe before, but I doubt it because the cookbook is free of food stains and I didn’t write anything on the recipe. This recipe interests me because the onion is cooked before it’s added to the hamburger, there is white wine in the meatballs, the eggs are separated and the whites stiffly beaten. (I doubt that this will make the meatballs much different from ones made with whole, non-beaten eggs, but it’s worth a try.) I like the accompanying sauce, with beer, potatoes and carrots. I don’t have a recipe in my repertoire that is anything like this one. Sounds good for a winter dinner, as I watch the snow fall on a November day in Colorado. I had some problems cooking these meatballs. I could tell that the uncooked meatball mixture was much more liquid-y than I would normally choose, and sure enough, when I dropped the first couple meatballs into the hot pan, they flattened out like pancakes. Well, the dogs will like those! I added another generous half-cup of breadcrumbs to the meat mixture and that did the trick. I tasted one of the cooked meatballs and said “yum!” As I had predicted, the high moisture content and egg whites in the meatballs made them light and almost delicate. 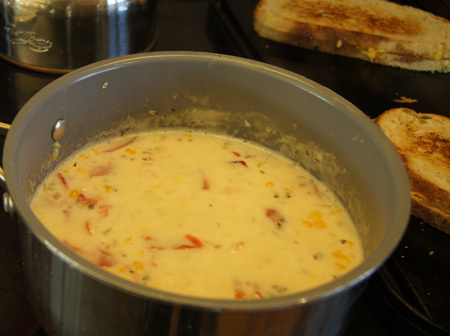 For the sauce, I recalled my Beer and Cheese Soup disaster, and substituted half of the beer with beef broth. As the sauce and meatballs and potatoes and carrots simmered together, I added more broth so that they would be covered. When the vegetables were done, I didn’t know quite how to serve the dish, since the sauce was thin. 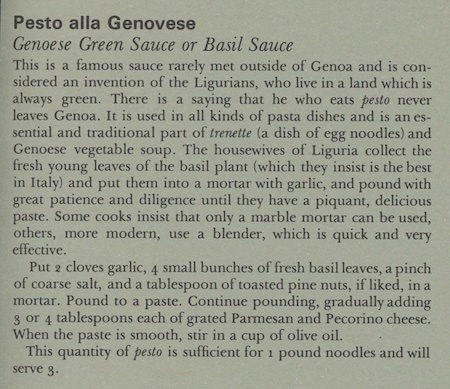 As written in the cookbook, there is no way this dish could be served over pasta or rice, nor could it be lain on a flat plate, because the “sauce” was just a runny liquid. So I thickened it with a little cornstarch and called it a “soup-stew”. I served it in big bowls with slices of My Daily Bread and cheese. It was really good! The broth suffused the potatoes and carrots with a hint of beer, marjoram, and bay leaf, and the meatballs were just about perfect. Heat a small amount of oil (olive or vegetable) in a pan and saute the onion, sweating with a little salt, until soft. Add the garlic and cook for 30 seconds more. Combine with the hamburger, bread-crumb-and-milk mixture, wine, egg yolks, and seasonings. Mix lightly but well. Fold in egg whites. Form into 1-inch balls and brown in a small amount of hot oil. These burn more easily than most meatballs, so watch the heat of the pan and turn the meatballs often. When they are all browned, drain off any fat. 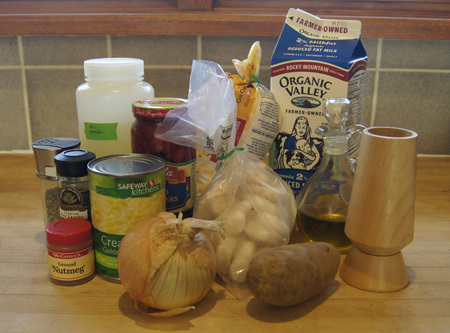 Add the sauce/vegetable ingredients—except the cornstarch mixture—to the meatballs and bring to a boil. Cover, and reduce heat to simmer for 20-30 minutes. If you like, add more broth so that the meat and vegetables stay down in the liquid. This will make it more soup-like. When the vegetables are tender, slowly and with stirring, add the cornstarch mixture to thicken the sauce. (You can add more cornstarch if you like it thicker.) Taste and adjust salt and pepper to your taste. We each finished our German Meatballs and wiped the bowls clean with bread!